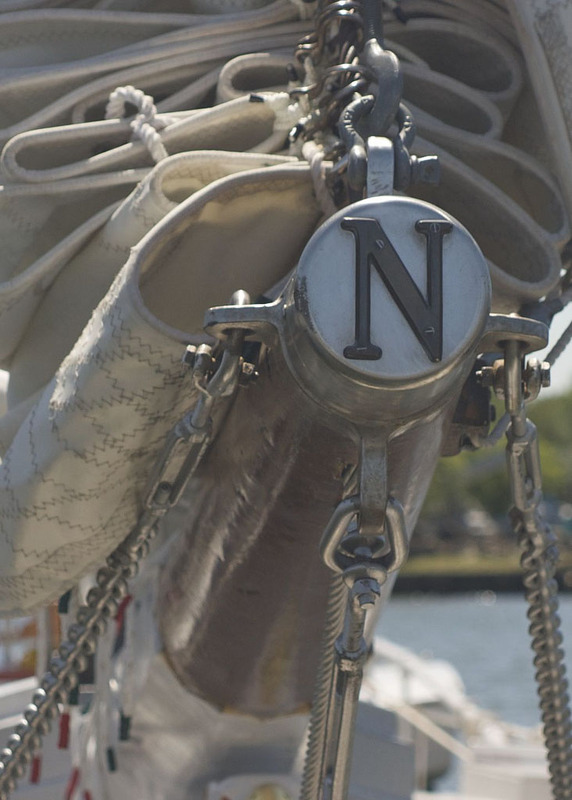 The Dorchester Skipjack Committee owns, preserves and operates the skipjack Nathan of Dorchester so as to promote Cambridge and Dorchester County’s maritime heritage based on tourism, by offering educational on-the-water experiences on a historically maintained boat. The Dorchester Skipjack Committee, an independent 501(c)3 nonprofit organization. Our volunteers continue to own, operate and maintain the Nathan with the support and donations of people like you. to help us keep the Nathan of Dorchester sailing, please donate toward our cause. 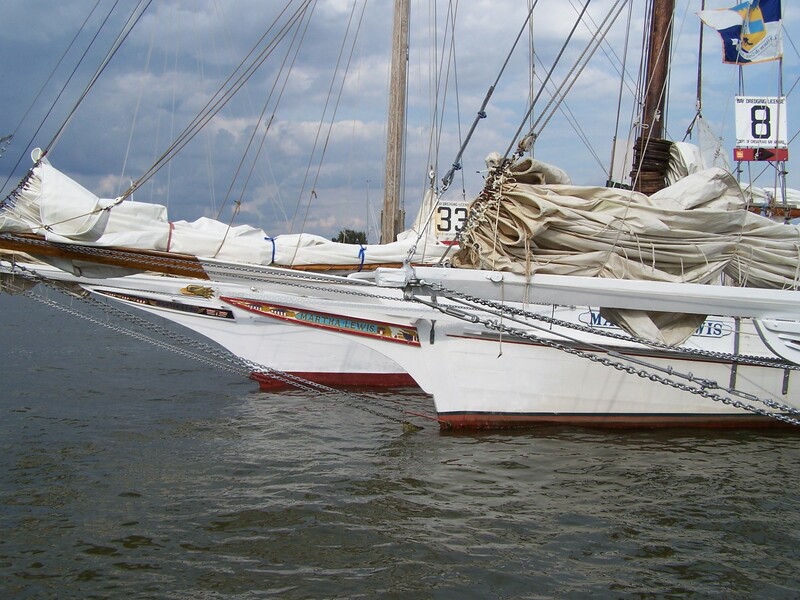 The “skipjack” is a unique type of commercial wooden sailing vessel, used for more than 100 years to dredge oysters from the Chesapeake Bay. Skipjacks are the last working sail fleet in the United States and are listed on the National Register of Historic Sites. The skipjack was named the state boat of Maryland in 1985. Launched in 1994, the Nathan of Dorchester is likely to be the last skipjack ever to be built as a sailing dredge boat. The Skipjack style of working sail boat was developed in the late 1800s due to the popularity of Chesapeake Bay oysters. Better road, bridge and rail networks allowed for a greater market range for fresh oyster markets and New England harvests were shrinking. In the mid-1800s, oysters were collected either by hand (tonging), or by using dredges on larger deep draft schooners, pungys and bugeyes. As oyster catches in deeper beds decreased, the need grew for a shallow-draft sailing vessel that could reach oysters found in shallower beds. This boat needed a low freeboard (deck close to the waterline) to ease hauling in the dredges, it needed to be easier and cheaper to build than the bigger boats and it needed a smaller crew to sail and dredge for oysters. The answer was the development of a larger-scale version of a small, single-mast boat with two sails being used by watermen at the time for dredging for blue crabs in the shallow grassy reaches of Bay tributaries. This boat became known first as the 2 sail bateaux then as its more popular name of the skipjack. Whatever the origins, major boat builders on the middle and lower Eastern Shore of Maryland began to build these modified sloops noted for their sharp chine and shallow, dead-rise hull with centerboard. 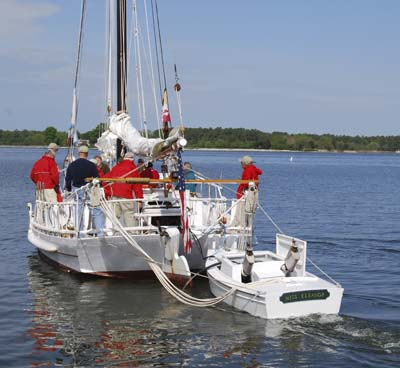 The single raked mast was placed well forward and the sharp bow was extended with a bowsprit, allowing the boat to carry a large main sail giving enough power to haul the big oyster dredges in light winds. A self-tending jib, allowed crew to concentrate more on dredging than on sailing. Builders and owners of these graceful, powerful sailing vessels named their boats after mothers, aunts, sisters, places or builders (but rarely for their wife) and decorated them with carved, brightly painted trailboards, bearing the boat’s name, and carried small carved figure heads under the bowsprits. Skipjacks generally ranged from 30 to 60 feet on deck and could carry 100 to 500 bushels of oysters. The Nathan is a medium-sized skipjack, built to carry about 200 bushels. With the development of the gasoline engine, the rowing dinghy typically hung on the davits at the stern was powered with a two- to four-cylinder engine. out with pushboat This enabled the skipjack to have a power source a pushboat or yawl boat) to move the boat to oyster beds in the event of light wind conditions. From the advent of steam power appearing on the Bay in the 1830’s and the gasoline engine around 1900 and until the mid 1960’s, skipjacks and other dredge boats could only dredge under sail. Today the few remaining skipjacks that dredge for oysters dredge under power.